It was a "get out of the house and into the fresh air or the grumps might take over the day" kind of morning over here. So we bundled up and went to the park. 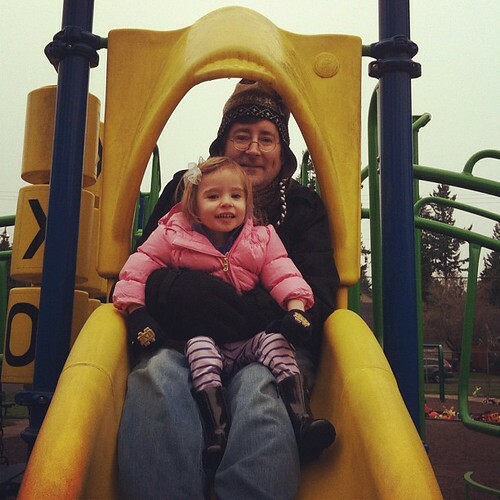 And Ellie loved running around and going down the slide with her daddy. And oh my gosh I love this photo. I love this real moment of Ellie's bravery when she climbed up to this tall slide and then looked at me and said "I'm scared." So her daddy climbed right up next to her so they could slide down together. Even though he groaned and mumbled as he tried to figure out how to fold down to join her, he did it anyway. And she cheered, "I did it!" when they got to the bottom. If I hadn't listened to what we all needed this morning, we might have missed it. The days are full over here. This holiday season has me working like a little elf as my shop is the busiest it has ever been. (I'm deeply grateful for this.) I'm trying to be present to the holidays and this time of year with my family. As I move through the day, it can feel intense and awesome and beautiful and so damn hard at times. I'm gently encouraging myself to try to let go of the expectations of this time of year. But goodness how they just hang there waiting for you to notice them, don't they? In the midst of it all, I'm giving myself some space to notice what I need. Sometimes this means closing my eyes while taking one deep breath and saying quietly, "What do you need kid?" And then allowing for space to listen to the answer. Yesterday that answer was 10 minutes of rest while Ellie napped. Late last night that answer was a promise to myself that I need a vacation in early 2013. This morning the answer was to get outside away from work and have an hour of play with my family at the park and then to Starbucks for treats. In this moment, my answer is a big glass of water and music I love. It's okay to be honest with yourself. It's okay to speak it aloud. It's okay to let your loved ones know. It's okay to rest, to dance, to ask for an hour alone, to ask for a hug, to say "no." Yes. It's okay to do all of this and more for you to help you feel supported and present this time of year. If you need someone to catch your answer today, feel free to share in the comments or email me. For more stories like this one and love notes from me to you, sign up for my (almost) weekly newsletter here.